Post Marathon Recovery & The Marathon Blues | So What? I run. Well, now what. The marathon came and went and I’m now in recovery mode and I’m really sucking at it. After the Baltimore Marathon last year, I followed the book when it came to recovery. This year, not at all. And you know what, I can really feel the difference. Proper recovery really does help. it appears that I was a busy girl this year, and 2013 isn’t even over with. Anyway, back to recovery. Below is an excerpt from the article I read and my comments on what I did last year vs. what I did this year. Walking for 10-15 minutes post-race to bring your body back to its resting state and flush lactic acid from the muscles. There was no choice but to do this after both marathons. Both races had it set up so that you has to walk everywhere. Eating a snack within 30-40 minutes post-race to begin replenishing glycogen (carbohydrate) stores and heal muscle tissue (protein). I ate snacks provided after the race. However, my post-race recovery meal came 8 hours after the race this year compared to 4 hours after the race last year. I definitely felt better eating sooner last year. Soaking in a cold-water bath for 5-10 minutes and wearing compression tights for the afternoon (not while sleeping). Both can help decrease inflammation in the body and speed the rate of healing. Last year I took an ice bath when I got home followed by a hot Epsom salt bath the next day. This year I did neither. It look longer for my muscles to feel normal this year and for the DOMS (delayed onset muscle soreness) to subside. I finally took an Epsom salt bath on Tuesday and I felt immediate relief afterwards. Should’ve done this sooner. Sipping fluids throughout the day. Last year I drank water and Gatorade for two days after the race. This year I drank dirty martini’s…lots of them. Definitely should’ve went with the water and Gatorade. Investing five to 10 minutes in the yoga pose “Legs Up on the Wall.” It refreshes circulation, gently stretches the legs, and is a great way to internally celebrate your race (especially when wearing your medal). Again, this is something I did last year and slacked off on this year. I should’ve taken the time to do this to speed up my recovery. Waiting at least two to six hours after the race to foam roll and at least 24 hours for a massage. This allows your muscles time to replenish fluids and energy and recover from the demands of the race. Ooops! We got massages right after the race and it was not pleasant. I should’ve read this article before and delayed the massage. I didn’t get a massage or foam roll until later after last years race and recovered faster. Treating race day like a car accident, giving your body time to heal with low-impact cross-training and yin activities like restorative yoga. Because running is a high-impact sport, racing hard or frequently demands equally intense recovery. You’ll gain more by doing less with activities that are easier on the body. Both years, I didn’t do much but lay around the following day. I think I would’ve been better off with a little more motion. Throughout the week, continuing to be active with short, easy-effort, low-impact activities (20-30 minutes elliptical, cycling, restorative yoga). The goal is to get your circulation moving and focus on mobility (foam rolling, massage) rather than train or burn calories. Your body needs downtime, especially in the first week after the race. Last year I was back to the gym doing easy workout as suggested. This year I’ve done nothing as I’m recovering from a post-marathon cold and wanted to give my body the extra rest I think it needs before this cold turns into pneumonia. After a race, your immune system is low from all the stresses you just put your body though making you more susceptible to getting sick. I swear it was the masseuse that gave me her cold…never again. The muscle soreness typically subsides within three to four days post-half or full marathon, but the healing goes beyond muscle soreness. Give your body time to heal without running for a week, and stick with the activities and regimen mentioned above. I don’t remember when I started back to running last year, but I believe it was a week later. Depending on my cold and the weather, I plan on running an easy 7 – 8 miles on Saturday. There were definitely lessons learned for me. I know how important recovery is and I should’ve respected the recovery. Next time, I’ll be more disciplined with the recovery process so that I can allow my body to heal and be ready for the next round of torture. I don’t know if all runners experience this, but I sure do. After months of training and working with a set schedule, I’m sitting here thinking, well now what. Nothing to look forward to, nothing to write about…just sittin’ around reflecting on the race and what I could’ve done to make it better. My next race isn’t until December and I don’t start training for the ultra marathon until December too. I’m sure it quickly subsides as I get my body moving, but this week is nothing but blah. Have you guys experienced this too? i keep saying “i want to go back to Sunday afternoon!” you know, after the race. Now it’s over…blah! i’m sure i will be happy this weekend when i go to run an easy 3-5 miles! Just need to get these legs moving again! 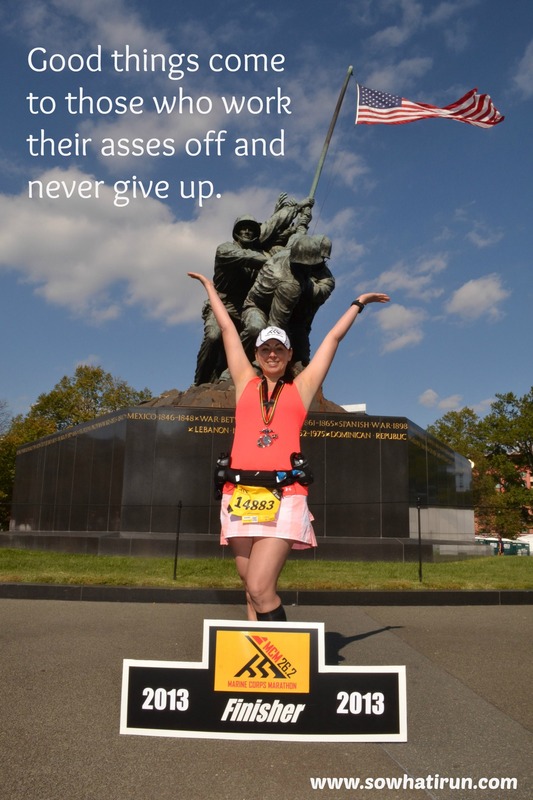 I feel the same way….post marathon blues for sure! My blisters are giving me some problems and I haven’t been able to go out for a short run and shake them off yet! And I’m so bummed! My “finisher” photo never showed up on Marathonfoto!! !